Hmmmmmmmmm....no to all the questions and a HUGE YES ...go back and ask! What could it hurt? I love playing the guessing game ! I definitely think you should go ask--tell them how much you enjoyed it! I've never done it but now that you mention it, there are a few dishes I'd like to get the recipe for! It never hurts to ask. I do and I've gotten positive and negative responses but they are usually happy that you like the dish well enough to ask. I've also been able to come up with recipes from the Web by using the name they use for the dish or by entering as many of the ingredients I can come up with in a Google search and see what comes up. 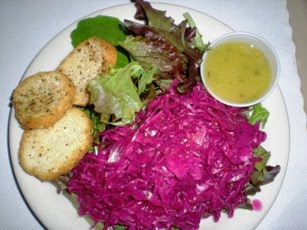 My mother used to marinate a refrigerator slaw in vinegar that had a little sugar and salt added to it and brought to a boil before pouring over the cabbage. Heating the vinegar dissolves the sugar and also softens the cabbage just enough that it soaks up the marinade. You might try that. I was often tempted to ask for a recipe, but never musted up the courage to do so. It never hurts to try! Kathy, I'll have to try your mother's method; I think it may be very close to what they did! Thanks for sharing! Sure - ask - it never hurts!! Can't wait to see what they say! love, love, love cabbage salads. i agree with everyone else...it never hurts to ask. haha, great question, I actually HAVE done that before, and no, they didn't tell me! I can't remember exactly what it was, but I'm remembering something about a soup. It was really great and I couldn't pinpoint what it was that made it taste so good. The waiter said the chef couldn't give it away, however, there have also been times when I asked and they did tell me. In fact one time I remember them writing the recipe down for me. If I were you, I'd ask! The cabbage looks great. Your salad is so colorful! Yes, I've asked for recipes, or what a certain ingredient is, and have even had the chef come to my table! i've never asked for a recipe, but why not!?!? I've never asked. But if you're feeling too shy you may try googling it. :) Good luck. Yes, go back and get that recipe! I never know what to do with red cabbage. This is the mixture that Mom used over a head of shredded cabbage. This was back when they used a lot of oil in salads. I think you could eliminate it completely if you were going to use a dressing as you served it or at least cut way back on the amount. Like my mom said- it never hurts to ask! Although I'm the biggest chicken- I've never done it! I looooove red cabbage! I would definitely go back and ask! Biz: 1) I love that you ate at Rick Bayless' restaurant! 2) How great that the server gave you a bag of habanero peppers! Kathy: Thanks for the recipe! I'll definitely make it! I never thought about asking a restaurant for their recipe since I always thought that the information is trade secret. Good to know that it is okay to ask.